Note: We no longer offer the Hubspot integration to new Nimble accounts. This article is only for Legacy accounts with the integration already enabled. We will be adding more Marketing Automation features to Nimble as a proprietery add-on to Nimble in the future. This is an overview of how to set up the HubSpot integration from within Nimble. To use this integration, you must be on at least a Professional or Enterprise subscription with Hubspot. They do not support Nimble for their Basic users. 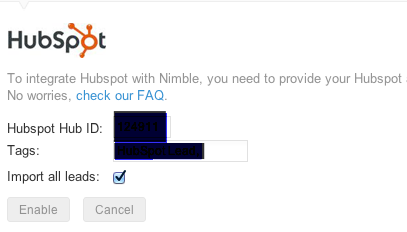 First of all, you will need to locate your Hub ID in Hubspot to connect your account to Nimble. 4. Enter your Hub ID and apply a tag for your incoming leads. 5. Enable the integration, and you will be all set up! Note: This integration will not work if you have customized the field names. We are only able to import through the default Hubspot field names. How do my Hubspot leads get into Nimble? Each time a lead fills out one of your Hubspot forms (starting the moment you connected your Hubspot account to Nimble). Do you import social profile URLs to Nimble? No. We are unable to import social profile URLs to Nimble through Hubspot. All leads in Hubspot will be imported into Nimble. Currently, we lack the ability to check for duplicate leads and merge them.This functionality will be coming soon! How are the Hubspot records in Nimble updated? 1. When a new lead has been created. 2. When lead has re-converted, i.e. the lead filled out a 2nd form. A new Hubspot lead in Nimble is missing data for the fields "Found site via", "First visit", and "Recent visit". Why are they missing? When Hubspot captures a new lead, Hubspot engages in log processing to find out when the lead's first visit was to the website. This could take anywhere from 30 minutes to overnight to find because the lead's first visit could have been a long time ago (i.e. a year ago). "Found site via" , "First visit", and "Recent visit" data comes from Hubspot's log processing. Before Hubspot retrieves that data, those fields in Nimble will be blank. But once Hubspot finishes overnight processing, Nimble will fetch that data from Hubspot. So while those fields will be initially blank, the data should be filled out the next day unless Hubspot could not retrieve it from their log processing. What happens if I manually update a Hubspot record in Nimble? Is it possible to modify Hubspot-specific fields in a contact record in Nimble? No. 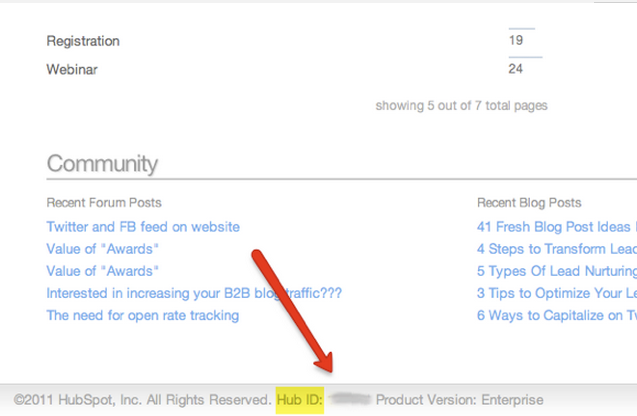 At the current integration stage, it's not possible to modify Hubspot fields. Fields will be updated only when a lead has triggered another conversion event in Hubspot. What Hubspot fields map into Nimble? 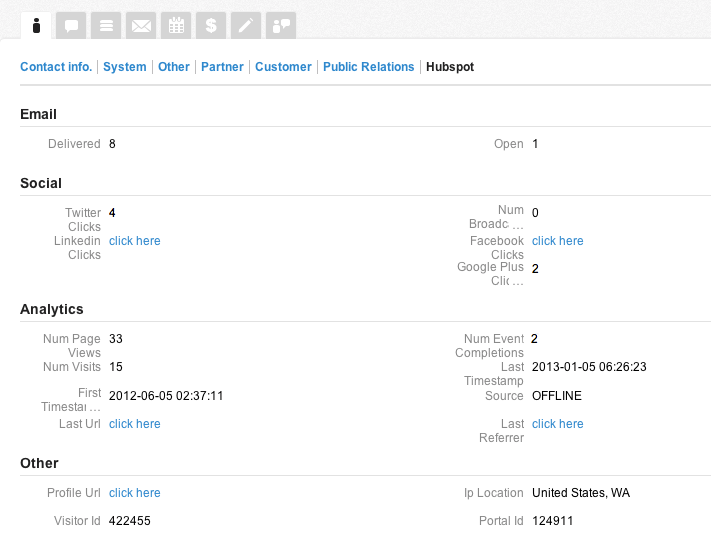 If any of the address fields are empty, Hubspot automatically detects the IP address and displays it in Nimble. 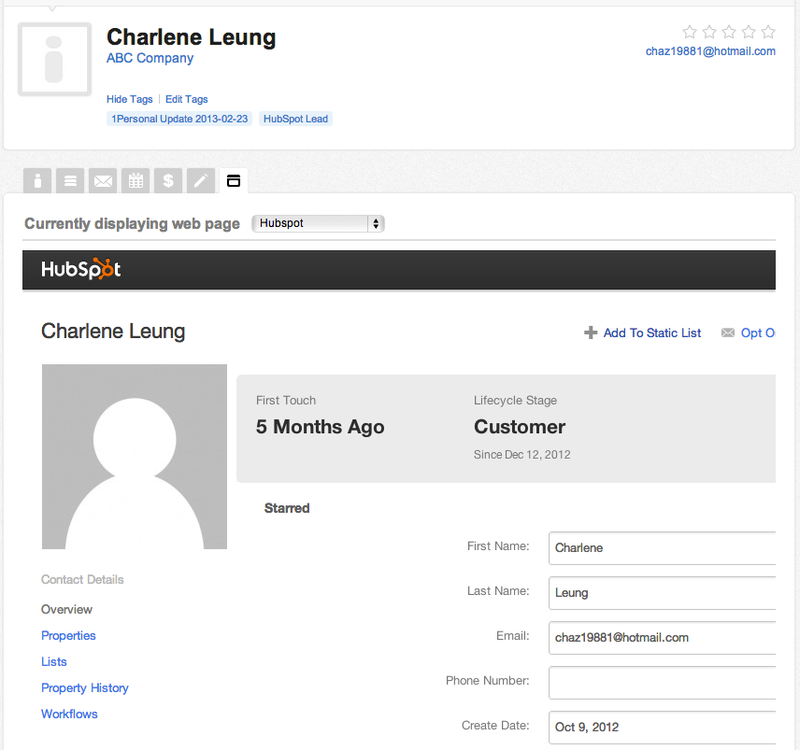 What fields display on Hubspot contact records in Nimble? What happens if I delete a Hubspot contact record in Nimble? If you delete a Hubspot contact in Nimble, and that contact triggered another conversion event in Hubspot (filled a 2nd form), the record will be created again in Nimble during the next Hubspot update. How often will my Hubspot leads update in Nimble? Your new and existing Hubspot leads will update once every four hours. Does Hubspot sync both ways to Nimble? No, but you can set up an External Web Page tab for Hubspot in Settings >> Integrations and you can view your lead's Hubspot profile while you are on their Nimble profile. For more details on external webpages, please visit our article here: Enable External Web Pages in Nimble.